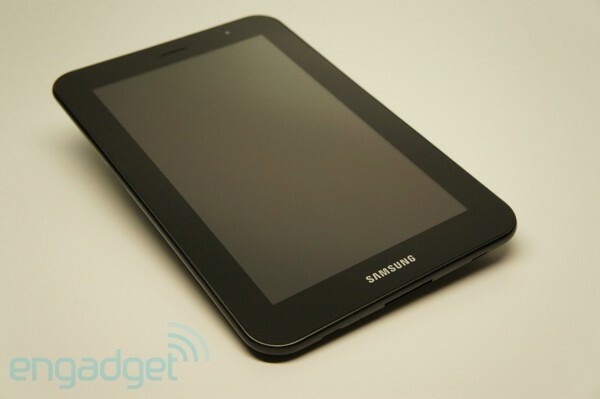 We've already established that the Galaxy Tab 10.1 is a great tablet. Then, just recently, we summarily found that the 1.2-inch smaller Galaxy Tab 8.9 is an even better tablet -- at least for anyone who wants to take their slate places. So, following that logic, the even more petite Galaxy Tab 7.0 Plus should be the best of the three, right? Not so fast. We've been here before, and things weren't exactly great. The original Galaxy Tab was, of course, a 7-incher and wasn't universally well received thanks to a number of problems -- the first being a $600 MSRP. Another issue was an Android 2.2 build that tried its best but was ultimately ill-suited for tablet duties. This new 7-inch installment packs a dual-core 1.2GHz processor, a tablet-friendlier build of Android 3.2 Honeycomb and a somewhat more palatable $400 price tag. So, it's clearly better equipped than its predecessor, but that one shipped a whopping 12 months ago. How does the newer, fancier Tab compete in this newer, fancier present? Read on to find out. The Galaxy Tab 7.0 Plus doesn't quite fill the footsteps of the larger 8.9 and 10.1, but is a great little slate in its own right. 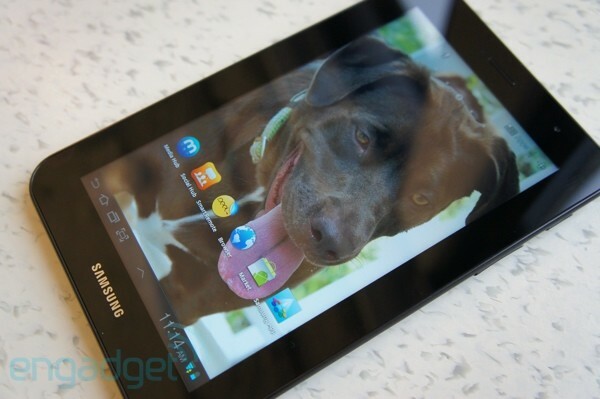 How would you rate the Galaxy Tab 7.0 Plus? Samsung's last tablet really did look like a slate that was run through the wrong washing cycle and came out a size 8.9 rather than the 10.1 it started as. The 7.0 Plus, however, is a rather different beast, slotting in somewhere between the 8.9 and the Galaxy Note both in terms of styling and, of course, size. It has the same faux-brushed metal backing that Samsung calls Metallic Gray -- despite being far closer to black and not having a hint of sparkle. And still being plastic. But, it does look cool and sophisticated and is far more pleasing to touch than the smooth plastic the company originally put on its 10.1. The non-removable back is perforated to allow the three megapixel camera and its LED flash to poke through, units that appear to be borrowed from the 8.9 and 10.1 that came before. With Skype installed those looking to make some calls on a comically large celly are certainly welcome to do so here. That is paired with a two megapixel camera on the front peering through the top-right portion of the LCD's bezel when held in portrait. That's a very different location than on the other recent Tabs, which put the shooter front and center on the top when you're holding the tablet in landscape mode. Why the change? Well, the 7.0 Plus is aping some phone styling here, including a gash in the bezel for a speaker and even a microphone on the bottom. The WiFi-only version we were sent of course doesn't support proper calling, and with Honeycomb it's clearly not meant to be a phone, but with Skype installed those looking to make some calls on a comically large celly are certainly welcome to do so here. The only thing missing is a proximity sensor to disable the screen -- and maybe an invisibility cloak to hide your look of shame whilst holding a 7-inch slate to your face. So this is a device intended to be held portrait-style, reinforced by Samsung putting its logo on one of the short sides rather than on the long side where it's typically found. This is again similar to the original 7-inch Galaxy Tab, which had its array of four capacitive touch buttons on the same, shorter side. No such buttons here -- Honeycomb has of course nixed that -- but the intent is still the same. The IR emitter opens the door for the 7.0 Plus to be the biggest, beefiest Harmony there ever was. The physical buttons here are limited to power and a volume rocker, are also in the same place as on the original Tab -- on the side on the upper-right. However, slotted in beneath them on the same side is something new and interesting: an IR emitter. IR has long-since fallen out of favor as a means of intra-device communication, replaced by Bluetooth and NFC and the like, but it is still the mechanism of choice for controlling home entertainment systems, opening the door for the 7.0 Plus to be the biggest, beefiest Harmony there ever was. 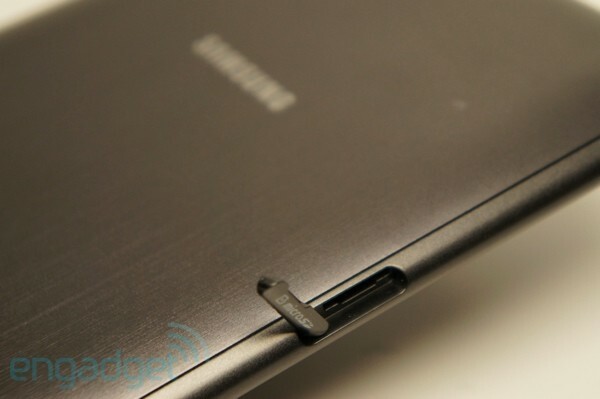 The standard 3.5mm headphone jack is found up on the top, shifted to the right, but continue around to the left side of the device and you'll find something a little less common: a microSD slot. Through this you can easily add up to 32GB of storage for music or movies or whatever. Pick up the 3G version of this device and you'll also find a tray for a SIM slot. Finally, on the bottom lies Samsung's proprietary 30-pin connector, flanked on both sides by two tiny little speakers that emit decent sound but at a maximum volume too low to be of much use in all but the quietest of small rooms. Connectivity options on this model include 802.11a/b/g/n at both 2.4 and 5GHz along with Bluetooth 3.0. The 3G model adds on 21Mbps HSPA+ (900, 1900 and 2100MHz) and quad-band EDGE/GPRS (850, 900, 1800 and 1900MHz). While the Galaxy Tab 8.9, the increasingly mythical 7.7 and even the Galaxy Note manage to offer the full 1280 x 800 resolution offered by the big boy 10.1, the 7.0 Plus sadly is asked to make do with a measly 1024 x 600. That's the same as the original Galaxy Tab and, while we wish this device had the resolution to match its bigger (and even smaller) siblings, it is otherwise a very nice display. Colors are rich and bright, contrast is good and, while it can't quite deliver the sort of mouth-watering saturation that the company's Super AMOLED Plus panels can manage, color reproduction seems to be spot-on. If the stock color temperature isn't to your liking, there are two others you can choose: Dynamic, which is a little too over-saturated for our tastes, and Movie, which tones things down a bit. Whichever you choose you'll have a great looking picture that doesn't go bad even at extreme viewing angles. The Galaxy Tab 7.0 Plus uses internals that are quite familiar at this point: a dual-core 1.2GHz processor paired with 1GB of RAM and either 16 or 32GB of storage. Unsurprising, then, that performance was also quite familiar. Despite being quite smaller than the 10.1, this guy blazes through most tasks with similar aplomb. Apps launch promptly and flipping through and examining pictures in the gallery is as smooth as you like. The only occasional hiccups came into play on web browsing, where webpages occasionally got a bit sticky and browsing became sporadically unresponsive. Disabling Flash helped -- as it usually does -- but out-of-the-box surfing wasn't quite all we'd hoped it would be. When we ran our usual spate of benchmarks, the results almost unanimously confirmed that this is indeed one speedy tablet. You'll see it bested the 7-inch T-Mobile Springboard ($430 off contract) in almost every test, save for the single-thread version of Linpack. Meanwhile, the 7.0 Plus blitzed through the SunSpider benchmark with an average score of 1,679. But it's in battery life that it really starts to pull away from the competition. In our rundown, which involves looping a movie off the tablet with WiFi on and the brightness fixed at 65 percent, it managed an impressive eight hours and nine minutes. That's really something when you consider the Springboard lasted just six and a half hours and the Acer Iconia Tab A100 came to a wheezing halt in less than five. And in case you're wondering, the 7.0 represents a marked improvement over the original Galaxy Tab, whose runtime was two hours shorter. 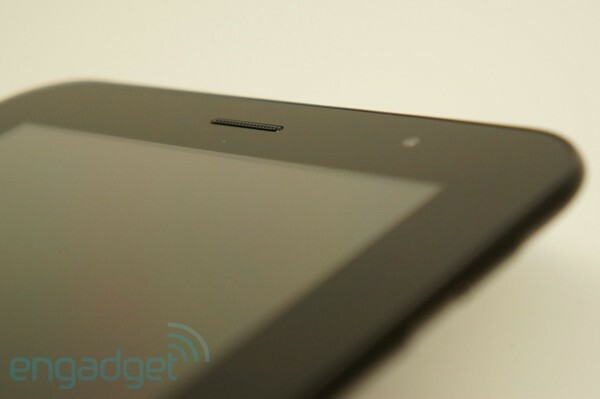 For the most part the Galaxy Tab 7.0 Plus feels like any of the other Galaxy Tabs to use. It's running Android 3.2 Honeycomb, customized with Samsung's TouchWiz interface that adds a number of useful tools to the mix: a task manager, a world clock, a finger-friendly note taking app, a calculator and a music player. They're all accessible by tapping on the little up-arrow at the bottom of the screen. TouchWiz also simplifies the look of Honeycomb a bit and adds some useful toggles to the settings menu that you get when tapping the wrench in the lower-right of the screen. All standard fare, that, but the Plus does bring something new to the software table: the Peel Smart Remote app. The app typically requires a $100 accessory to work but, thanks to the IR emitter built into the top of this guy, you can use it like a jumbo-sized universal remote control. To set up the app you're basically asked to turn off all your devices and sit somewhere in their general proximity. Rather than digging through endless lists of obscure product names as you struggle to remember whether you bought the Onkyo SR504 or sprung for the SR604, the Peel app just asks you to remember the brand of your device. It then starts firing out IR commands with wild abandon, asking you after each one whether your device turned on. Once your TV or receiver or DVD player springs to life, happy day, you're configured! That said, if it never does you're in trouble. The app automatically prompts you to email Peel's customer support and enter the particulars of your device, something we had to do for one of our recalcitrant receivers, and they were quite quick to respond. This does cause problems in some cases, though. For example, we use a Harmony remote with a Nyko BluWave IR receiver to control our PS3. That works great for media playback and navigating through the XMB, but there's no way to turn the console on or off with this. And, if you can't turn the device on, the Peel simply wants nothing to do with it. So, watching movies on our PS3 was not something the Plus 7.0 will allow -- at least with this app. But, we can't wait to see what other developers can do. We also had problems with our TV, an older Sharp LCD that lacks discrete commands for its inputs. With the Harmony you can configure the remote to cycle through the available inputs as you switch from one activity to another. The Peel app, on the other hand, refuses to play nice. So, you certainly lose some configurability with Peel compared to the Harmony platform, but it is a very easy to set up and use app, and once configured it makes finding things to watch a snap. The app asks what your favorite type of shows and movies are and it goes out of its way to help you find those things on live TV. You'll get an easy grid highlighting what's on. Tap anything you like and it'll take you directly to that channel. 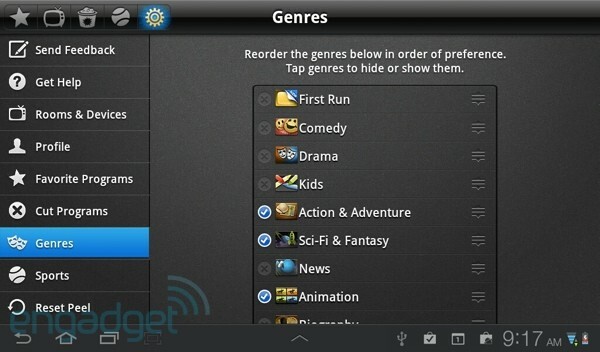 You can also browse by genre and, in general, look at your TV listings in a whole new way. This is great if you often find yourself struggling to find something good to watch -- bad if you're the type who finds yourself idly sitting in front of the TV when you should be getting things done. 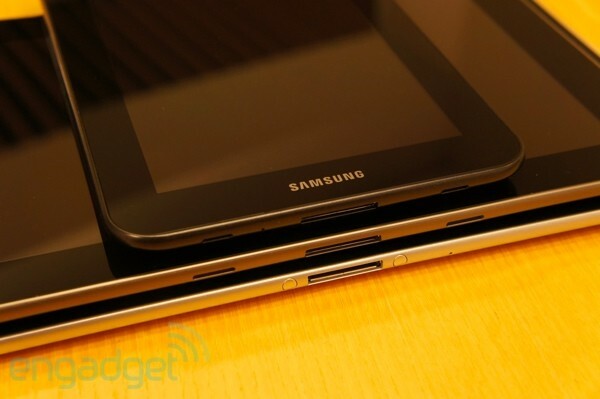 Just who exactly is the Galaxy Tab 7.0 Plus trying to usurp? That's hard to tell, as the 7-inch slate category is still a bit under-served, but it's safe to say that this guy's strongest competition comes from its own big brother, the Galaxy Tab 8.9, which loses the IR emitter and microSD expansion but adds on a higher-resolution screen with a bit more room. If you're squarely stuck on the 7-inch size the T-Mobile Springboard is a solid competitor priced at just $30 more off-contract and, for that money, offering 3G connectivity. Of course you'll have to pay for data if you're hoping to take advantage of that, but anyone willing to sign on for a two-year contract will find themselves paying just $180. We'd also be remiss if we didn't mention the Iconia Tab A100, which costs just $330, though, again, that discount means you'll have to settle for considerably shorter battery life. Stepping away from Honeycomb we have both the $350 BlackBerry PlayBook, $400 HTC Flyer (with Gingerbread), $200 Kindle Fire and the $249 Nook Tablet. The PlayBook and Fire are well-constructed but, with their angular shapes, a bit less comfortable to hold -- they're heavier, too. RIM's tablet adds HDMI output to the mix, making it great for hosting boardroom presentations, while Amazon's tablet offers an easy view into a very impressive collection of premium media, and of course costs just $200. The Flyer adds stylus input to the mix, while the Nook Tablet is of course quite comparable to the Fire -- just with slightly better specs and aesthetics. The Galaxy Tab 7.0 Plus really is a gussied-up, slimmed-down, priced-right version of the original Galaxy Tab. If that tablet had released last year looking and feeling (and costing) like this one does it would have been a revolution. As it was it never found that level of success and, while the 7.0 Plus is definitely a far better device, it just doesn't have anything that makes it stand out among Samsung's increasingly busy selections. The performance is good, the IR capabilities are a nice touch and the expandable storage will definitely tempt those with a few extra microSD cards lying dormant. But, for just a little more money, the 8.9 feels like a much more comprehensive tablet and the 7.7, if it ever releases, will quickly make this guy obsolete with its 1280 x 800 Super AMOLED Plus display. And of course there's the Note, which can do proper double duty as a phone along with everything else the 7.0 Plus can do. While the ideal size for a tablet is a personal decision, amid the increasingly chromatic scale of tablets Samsung is offering we can't help but feel the 7.0 Plus comes in just a little flat for our liking when compared with the almost pitch-perfect 8.9. That said, those looking for something a bit more portable will sing high praise for this 7-inch slate.